According to Accenture’s just-released Digital Consumer Survey, sales of home-based intelligent assistants such as Amazon Echo of Google Home grew more than 50% in every one of the 21 different countries the company surveyed. And according to a new research from Adobe Digital Insights (ADI), voice-assistant sales grew 103% year over year in the fourth quarter of 2017. Adobe also found that 22% of voice assistant owners said that they shop using voice commands. And people say voice in customer service is on the decline? The fact is that voice-to-agent is on the decline. But voice-to-virtual assistant is on the rise. 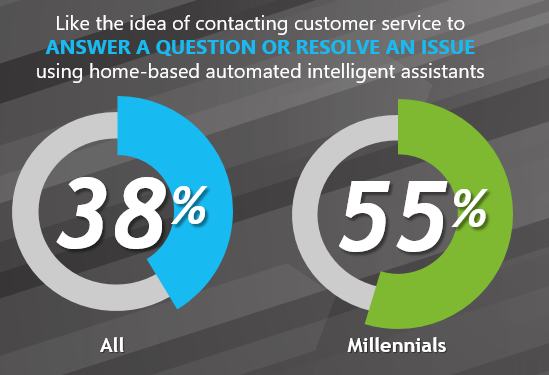 In the Aspect Consumer Experience Index, we found that 38 percent of consumers, and 55 percent of Millennials said they like the idea of contacting customer service to answer a question or resolve an issue using home-based automated intelligent assistants. But importantly, we also found that 45 percent of consumers said that they don’t care if their online purchase or customer service is performed by a chatbot or a live service agent as long it’s handled quickly and accurately. Ignoring customer service has always been a detrimental business decision. And that is still very true today. But ignoring customer service trends can be equally devastating. In the 2016 Aspect Customer Experience Index, 67 percent of consumers said a personalized customer service experience was more important than the speed of service. And in this year’s survey, we found that 48 percent of consumers feel the ability to interact in the method/manner of their choice is the most important facet of a personalized customer experience, 3 times more than knowing their name/history. 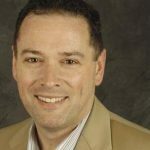 • Consumers are tired of older technology – voice is in rapid decent, people hate IVR most of all. 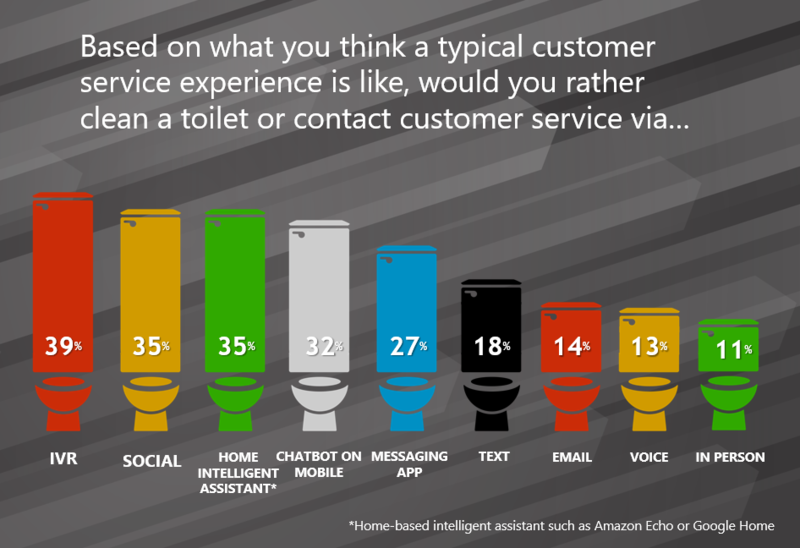 In fact, 39 percent of consumers said they’d rather clean a toilet than contact customer service via an IVR, the highest of any channel. The media is the message and if a brand’s primary channels are not the preferred channels of consumers, they will be perceived as not caring. Interaction on consumer channel of choice is essential in creating meaningful engagement with them. • Addressing customer concerns can mean improved bottom lines: Improving effectiveness in customer service will not only enable brands to retain customers it will also increase wallet share. 68 percent of consumers, and 78 percent of Millennials, did more business in 2017 with companies because of good customer service last year. Plus, 52 percent of those consumers said they’d pay more for good customer service. The fact is, enabling a customer to engage your brand in the manner and method they chose is going to make them happier. And if you make them happier, they are more likely to want to do more business with you while paying a little extra as well.